Members of the Massachusetts School Library Association report from the ALA annual conference in Washington, D.C., June 2007. Here are the members of the Executive Board of the Massachusetts School Library Association who contributed to this blog. In front: Kathy Lowe, Executive Director and Sandy Kelly, President. In back: Ann Perham, our Webmaster, with Gerri Fegan and Linda Friel, Northeast Area Directors. Thanks to the very gracious and patient photographer at the Polaris Library Systems booth, Jack Hartzman from Washington Talent, Photo and Video, who took the time to squeeze us all into one shot for a great memento of the conference. Now that I've been home a week, I have had some time to reflect on our experiences at ALA in Washington, D.C. There was so much to do and so many people to meet and listen to. The number of activities and events was simply overwhelming, especially for folks who have not attended an ALA conference before. I have gone to a number of AASL conferences and have loved going to them and meeting other librarians and library media specialists. This ALA, however, was much larger, with close to 30,000 people in attendance. Going to a conference, either ALA or AASL, is probably one of the most useful and fun professional development opportunities that will ever come along. All librarians and library media specialists should try to attend at least once or twice during her/his career. You will not regret investing the time, nor the money. Consider it an investment in your professional future and a gift to yourself that will keep on giving to your colleagues and your students when you return. Ken Burns and his presentation on the importance and power of history and a preview of his new documentary about World War II, entitled War. The documentary deals with the war as seen through the eyes and remembrances of regular Americans and brought tears to my eyes. I am eagerly looking forward to its debut on PBS in September, 2007. Judy Blume's presentation when she spoke of how and why she became a writer and how she has become reinvigorated and eager to continue writing. Meeting and chatting with author Walter Dean Myers during a Holiday House reception. Meeting, talking, and having our picture taken with Nancy Pearl during a Publishers West Group reception. I have had her librarian action figure on my desk for several years. Attendance at the two AASL Affiliates--this provided me with opportunities to see how AASL actually operates. I met many terrific and hardworking library media specialists from throughout the United States, and I look forward to meeting with them again at AASL in Reno. The Library of Congress Reception where we were greeted by Librarian of Congress Billington and were allowed to wander into special exhibits and some parts of the building. The building itself is certainly noteworthy and beautiful. The exhibits served their purpose in whetting my appetite for viewing more of the extensive collection that the LOC contains. I still marvel that my fellow librarians and I were chatting, eating, and drinking while studying the Gutenberg Bible that was in a nearby case. I still shake my head when I think about it. Seeing and listening to Julie Andrews and then nearly bumping into her in the hallway after her presentation. Library Day on Capitol Hill when it was annnounced that the SKILLS Act had been filed in both the House and the Senate. This bill has the potential to enormously impact every media center in the nation, and the ramifications to student opportunities and achievement are mindboggling. Please write to your Senators and Representatives and urge them to support the SKILLS Act. My reflections are complete, although, unfortunately, I don't have room to include all of them. I want to thank the four other members of MSLA who also went to ALA and helped me to have fabulous personal and professional experiences. I hope that all of you will attend a national conference. Consider it an investment in your professional future. One thing I haven't reported on yet is the RUSA MARS panel presentation on social networks and libraries with Matthew DeJune from Purdue, Tim Spauldling, founder of Library Thing, and Meredith Farkas, "Queen of Wikis". I was particularly interested in this session because Meredith will be presenting at our annual MSLA conference in November and I wanted to see her in action. She is an engaging presenter and her part of the presentation was well-organized, with a good PowerPoint to go along with it. She gave an overview of how public and academic libraries are using social networking tools, particularly wikis, and also spoke about something many of us probably haven't even considered - the issue of Knowledge Management - suggesting some ways we might think about using wikis to maintain institutional memory. I can see many applications for school libraries in the examples she showed and hope that her presentation in Massachusetts will inspire some of our K-12 librarians to delve into Library 2.0 tools. Meredith maintains Library Success: A Best Practices Wiki and blogs at Information Wants to Be Free. She also writes a monthly column for American Libraries on information technology. It was a pleasure meeting her in the Exhibit Hall at the Information Today booth and having her sign my copy of her hot-off-the-press book, Social Software in Libraries: Building Collaboration, Communication, and Community Online. A large group of AASL members made it to Capitol Hill on Tuesday for the press conference announcing the filing in both the House and Senate of the SKILLS (Strengthening Kids’ Interest in Learning and Libraries) Act. It was reported that there was great applause following its introduction on the floor of the Senate. Watch your email for more information to follow on how to contact your Members of Congress to support this act. Sandy Kelly, Ann Perham, Gerri Fegan, Linda Friel, Alma Ramos-McDermott (shown in photo at left), Susanna Paterson and I were there for the rally and press release. Some of us stood right behind Senator Jack Reed when he made his announcement to the press. It was a boiling hot day in the sun, but we were there on The Hill for this historic event. 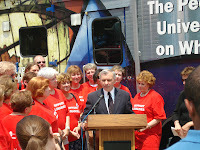 Senator Reed announced that his legislation will ask for a qualified school librarian in every school by the year 2010. I had been waiting weeks for the day when I would finally get to see my idol, Julie Andrews, at the ALA Conference. So many of us have seen her in films and television, listened to her crystal voice on recordings and laughed at her performances. Growing up in the sixties, I was inspired by Camelot, The Sound of Music and Mary Poppins to learn to sing and kept it up in college at the American Academy of Dramatic Arts. No doubt about it, I always wanted to sing just like her. Of course, that would have been impossible. There is no one like Julie Andrews. Her appearance at the conference began with a video montage of her work as a child star in England and continued through her most recent performances in The Princess Diaries. As she entered the hall, she was greeted with thunderous applause and a standing ovation. She broke the news immediately: she was just that day asked to chair National Library Week, and was accepting without hesitation. Her work with Harper Collins to produce "The Julie Andrews Collection" imprint was going to reproduce out-of-print books that would keep alive the words that would lead children to a greater wisdom and understanding of literature that would again lead them to wonder about the world. "Words, Wisdom, and Wonder" is the motto that appears on all the books in the collection also produced by her daughter Emma Walton Hamilton. The mother and daughter pair have most recently collaborated on The Great American Mousical and both later signed copies of the book for 100 lucky ALA members. I was one of them. Today we had so many experiences that we will have to write about them over the next few days, but for now, you can look at all of our photos on flickr. Other people's conference photos are also posted on flickr. Also, there are many other people blogging this conference and AASL has an official conference blog, so you can read about all the other things going on. We ended the day at a reception at the Library of Congress, hosted by James H. Billington, Librarian to us all. Watch your local news tomorrow for Senator Jack Reed's press conference about his bill to include school librarians as highly qualified under No Child Left Behind. We'll be there cheering him on with thousands of our colleagues. Sunday morning we attended a Scholastic Breakfast. This was an opportunity for Scholastic to introduce its new set of high interest books entitled Science Behind the Scenes: Forensic Files. The main speaker was Dayle Lynn Hinman, a renowned and famous criminal profiler who appears on Court TV's Body of Evidence. 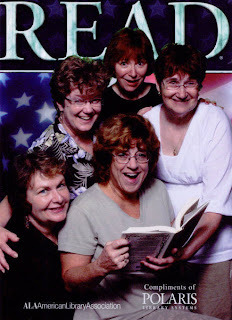 Three of us went to AASL Affiliate. This body meets at conferences and discusses concerns and commendations that are passed on to ALA; it usually takes six months to move through the process. All regions of the country are represented, and it is wonderful to meet folks from other parts of the country. We spent time in the Exhibit Hall checking out all of the vendor displays. The hall was huge, and we managed to to get lots of goodies that we will be giving away at our conference in the fall. It was a great opportunity to ask vendors questions and obtain information. I attended the Judy Blume presentation in the ballroom. 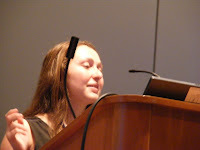 She has not presented at ALA for a number of years and was thrilled to be there. The bulk of her presentation dealt with how she became a writer and was both informative and moving. Judy thanked all of us for supporting her throughout her career and indicated that she still has many things to write and will continue writing books. There are still many events and presentations to attend, and we are trying to take advantage of as many as possible.